TIP OF THE DAY: Julienne Or Shave Those Veggies! Give a new perspective to everyday foods with some creative slicing. 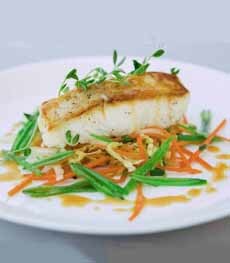 In these dishes, Chef Jennifer Day of Upper Story By Charlie Palmer in New York City, juliennes the vegetables and serves them either cooked, as with roasted halibut in photo #1; or raw, as with the grilled chicken salad in photo #2. 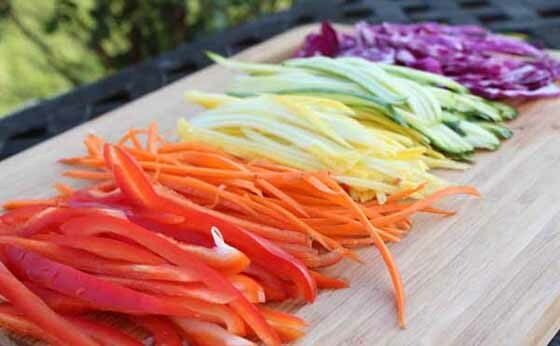 The vegetables, cut in julienne slices, are an attractive change from coins and other vegetable cuts. Julienne slices are often called matchsticks in the U.S.; although the French word for matchstick is allumette, there is no single word translation for “julienne” (which means “to cut into thin ”). And, truth to tell, we usually cut the slices into julienne’s big brother, the batonnet, which measures approximately 1/4 inch x 1/4 inch x 2-2.5 inches. And yes, we cut a “long batonnet” ((the word means “little stick”). It’s a personal thing. There are different options to create your vegetable slices. This is how chefs do it, and it’s a good opportunity to work on your knife skills. Check out the video below, an Americanized version of the French technique. Just be sure your knives are sharp (otherwise, they can slip and cut you). If you own one and never use it, here’s an opportunity to put it to work! The slicing disk of a food processor is designed to produce slices around a quarter-inch thick. Don’t use the shredding disk or you’ll end up with slaw! You won’t get the same cut as with the prior options, but you might like the result. Hold one end with your non-dominant hand and peel using even, heavy pressure. Once one side is finished, rest the flat surface that remains on a cutting board. This technique works for long vegetables with thin skins. 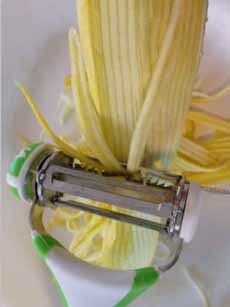 There are also julienne peelers, with teeth (photo #5). This one (photo #5) got rave reviews from someone we know. We tried it, but it wasn’t an instant success for us (we needed to practice, practice, practice). Here’s how to use it. If your peeler blade is dull, you’ll most likely need to buy a new one since they can’t be sharpened. Spend a bit more, and get a Kyocera Perfect Peeler, which has a ceramic blade that will stay incredibly sharp for 20 years or so. The visual effect is different from a julienne, but just as tasty! The following are easiest to cut into short or longer matchsticks. Roast halibut on cooked (al dente), julienned carrots and green beans. 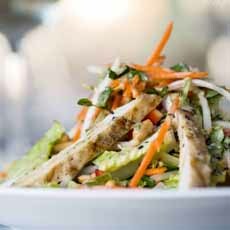 Sliced grilled chicken on a mound of salad with julienned vegetables (photos #1 and #2 courtesy Upper Story By Charlie Palmer | NYC. 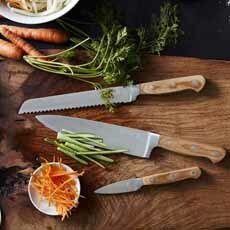 If you don’t like to julienne with a knife, there are two other options (photo courtesy Williams-Sonoma). 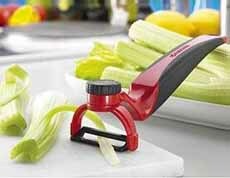 This Kyocera Perfect Peeler has a ceramic blade that will stay sharp for 20 years or more. The World’s Greatest 3-in-1 Rotational Tri-Blade Peeler, Julienne Slicer, Serrated Soft Skin Fruit Peeler and Straight Blade Vegetable Peeler—possibly the longest-named product we’ve ever seen, from Harold Import Company. Video from iVillage |YouTube. Photo of julienned vegetables courtesy JuliennePeeler.info.